In 1939 at age 17 years joined the TERRITORIAL Army & attended TA Camp July 1939. 1st Sept 1939 WAR Declared with Germany. After a month in a Drill Hall ( No Beds or Blankets initially ) @ Drill Halls at Westminster,, Uxbridge and on to Folkestone. POSTED to Middle East in 1941 as a DIVISION to EGYPT were Fierce Fighting took place between the ALLIES and GERMAN & ITALIAN’S. The Division was taken to EGYPT on old Liners, twenty in all, via South Africa. The WESTMINISTER Rifles, saw ACTIVE Service @ both Battles of EL ALAMEIN in July and October of 1942. 156 Battalion moved to TUNISIA the Fighting in that area was just finishing. September 1944 , OPERATION ARNHEM, Dropped into HOLLAND, with 2 PARA 1st AIRBORNE Division to try and Capture BRIDGES over the RHINE. 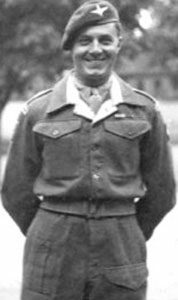 John was WIA, a Head Wound and was Captured, John was a member of 2nd Battalion the PARACHUTE Regiment of the 4th AIRBORNE BRIGADE. The BATTLE lasted for nine days, during the WITHDRAWAL he became a Prisoner of War ( POW ) he remained a POW in GERMANY for the rest of the WAR. A period of EIGHT MONTHS till the WAR ended MAY 1945. As a POW he worked in the GERMAN COAL MINES & Local BRICKWORKS. In October 1968 they became Ten Pound POMS and Sailed out to Australia to join their Daughter Jenny. They Built a HOUSE in PURLEY Street, BAYSWATER where lived for 25 years. In August 1969 LISA was the first of 4 Grandchildren to be Born, Susan then gave birth to a Daughter, ROBYN, REBECCA, and son MICHAEL. JOHN FREDERICH HATELY was a Member of the RSL Highgate, John attended their Monthly Functions. He became PRESIDENT of this elite club, The RSL HIGHGATE. In later years was also a WARDEN at the State WAR MEMORIAL King’s Park. This State WARDEN Party is supplied by the HIGHGATE Members of the RSL ANZAC House. John Frederick HATELY, Born 16th March 1922, passed away in PERTH, Western Australia on the 24th December 2015, aged 93. He is Survived by his 4 Grandchildren and 3 Great Grandchildren. He will be deeply missed and his memories will be Cherished for many years to come. I can’t hold back the minutes, They fly by much to fast. I can’t postpone the Future, Nor yet retrieve the Past. Is Polish up the Here & Now, For that’s Forever Mine!